The new Byocycle FDXL Folding Electric Bike is a sturdy 24" wheeled folding bike with high end specification and a powerful 36v battery. Perfect for all terrains. The FDXL bridges the gap between the new Tornado and the Ibex/Zest Range. Having the larger 24” wheels makes it perfect for the taller rider (up to riders 6’4) or riders who want to travel a bit longer, but still want to fold their bike when they get there. 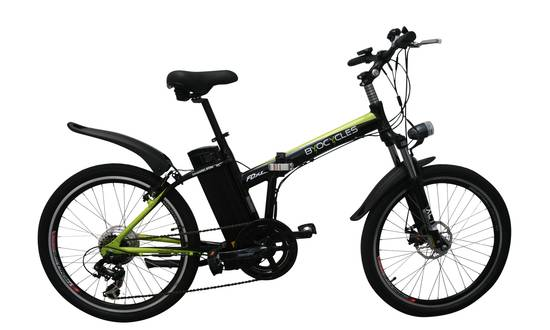 UK-based company, Byocyles, present The Byocycle FDXL Folding Electric Bike?. The practical e-bike with flair. Simple to fold and transport and at an amazing price for a bike of this power and build quality. This compact but fully featured ebike is great for cycling around town or rural areas. It has a small profile when folded so you can pack it into a car or on a train.